The ability to scan papers is a common thing for each modern office. Image scanner is a device that optically scans papers and converts them to digital images. 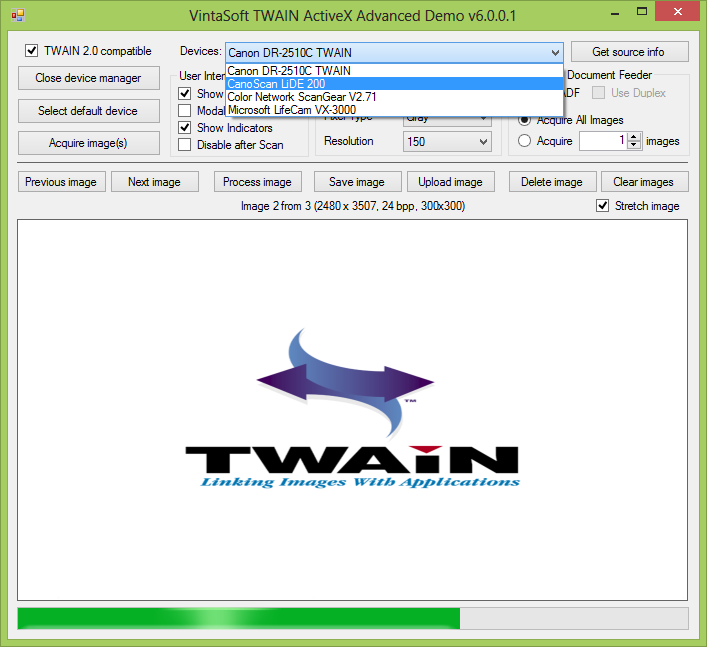 TWAIN is a standard that regulates communication between software application and scanner or camera that has a TWAIN device driver called Data Source. 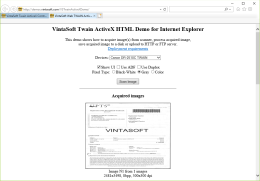 VintaSoft Twain ActiveX is the professional image acquisition library, which allows to control flatbed and ADF scanner, web and digital camera, and any other TWAIN compatible device in any ActiveX environment. 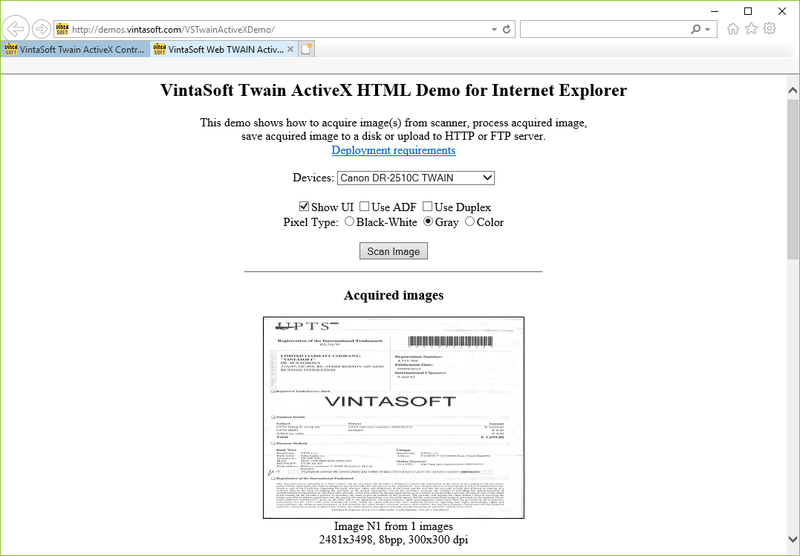 The evaluation version allows you to test the VintaSoft Twain ActiveX features for free and determine if the ActiveX functionality suits your needs in practice. You have to acquire a license if you want to use the ActiveX without evaluation restrictions. The ActiveX comes with demo applications for VB6, Delphi, C++ Builder, VB.NET, Visual FoxPro, MS Access, Internet Explorer and Object Rexx, demonstrating the general ActiveX features. The demo applications simplify the process of ActiveX functionality evaluation allowing quickly determine whether it suits your specific requirements. You have to download and install the ActiveX evaluation version to your computer if you want to run and test our demo applications. The ActiveX is delivered with detailed technical documentation file, which includes User Guide, ActiveX API Reference etc. The ActiveX has also a list of frequently asked questions and answers to them: F.A.Q. page. 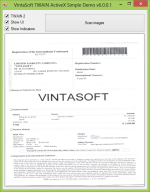 For using the VintaSoft Twain ActiveX in production is necessary to choose and acquire the right license for your application from three offered types. Developer license is intended for use by an individual developer. Site license allows the use by a developer group working at an office. Both developer and site licenses allow to develop non-web applications and distribute them royalty free to any computer. Single URL license is intended for web applications and is bounded with a server domain name or IP. 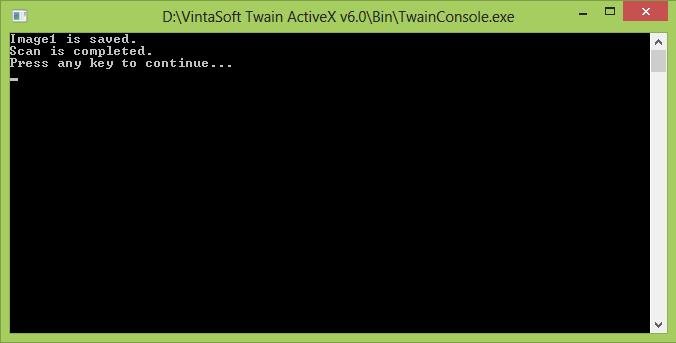 All you need to know about the licensing of VintaSoft Twain ActiveX you can read in the License agreement. 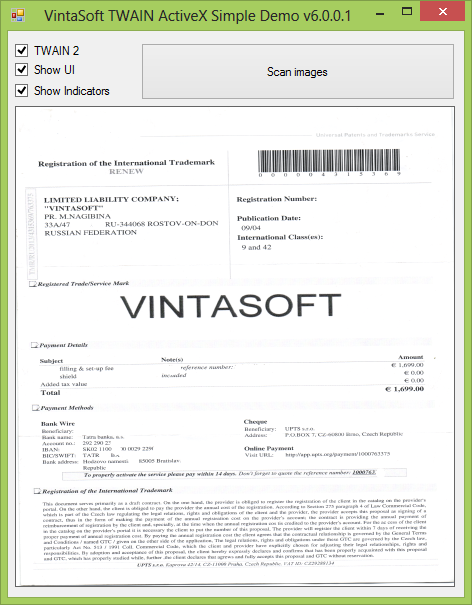 We purchased the Vintasoft ActiveX Control a little over a year ago and it has performed flawlessly. I wanted to say thank you. We originally bought the control to integrate it with an MS Access database to track checkouts. We used the control to scan driver's license images and photos. Things are working great. I have been at a trade show demonstrating my new application containing your control. It has been a great success so far! My sincere thanks to you for your quick resolution of issues. Great stuff, you made my life a lot easier, was looking through the WIA documentation on Microsoft, but was kind of scared away of all the tricky stuff. But I don't have to look further as your products both seems to be well written and most important for me, not very expensive. I just wanted to inform you that the Scanner Control is one of the best that we could get online. It works very fine, and merges well with our development environment.